Tonight, Michael Robertson broke a new record for censorship on his blog at michaelrobertson.com. Robertson was once again trying to justify making copies of music files and storing them in lockers without authorization (the same thing he did that tanked MP3.com). I made a legitimate post to his forum and my post was censored in less than three minutes! Wow, they're fast with the censorship button over there. =) Instead of rebutting my post, or responding to it, Robertson just has it censored. Nice! Here is a copy of my post, for those of you who blinked and missed it before it was censored. (Click on the image to enlarge it.) You'll see from the "PS" in my post I was even expecting to be censored, knowing how much Robertson dislikes contrasting points of view. Click on above image to view my censored post at michaelrobertson.com. 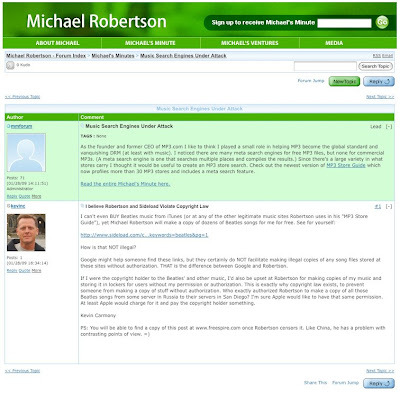 It appears censorship remains alive and well not just in China, but at MichaelRobertson.com. Michael is welcome to post to my blog's forum anytime without fear of censorship. In fact, the Linspire shareholders would love to hear from him and what happened with Linspire's cash and assets. Quite honestly, this wouldn't bother me in general -- their site, their rights. The reason this bothers me is that MR has always thrown the censorship argument around for his own benefit. This sort of hypocrisy is just plain irritating. for what are you sued for by MR? Your comments here or does he want freespire.com? If you visit freespire.com and click the first link it will take you to my blog about this. 1. When I was CEO, we tried several times to get the Freespire.com domain name (in addition to the Freespire.org name we already had), but the domain name owner wasn't interested in selling. 2. Linspire never did get a trademark for the term Freespire and after I left, thy actually abandoned the application I had filed when I was CEO. 4. When Robertson found out I was using Freespire.com as a gripe site, Linspire THEN filed for a trademark. Robertson sold Xandros but (or so he claims) kept the right to sue me over the Freespire Trademark (which again, Linspire never even had). 5. The site was certainly not creating any confusion, as it was clearly NOT from Linspire. Linspire didn't have a Trademark or even a pending trademark when I started using the site. Linspire sold Freespire to Xandros. I never used the Freespire logo on the site. Looking at these facts, it's pretty clear to me this was simply a lawsuit to bully me and try to silence my critical blogs about Robertson at the Freespire.com site. Robertson should know that I'll spend every last penny I have defending my freedom of speech. I believe Robertson likes to bully people with law suits. I've never filed a lawsuit in my life. Most people haven't. Yet Robertson seems to always be involved in litigation. Should give anyone pause before having any business dealings with him. Ah, now you know MR are is all about the drama, Kevin. You were always the reasonable one. Really, he's not worth your time. Get this frivolous lawsuit behind you and forget about him. You're better than he is and undoubtedly have better things to do. "We will be closing MediaMaster down. I would like to thank our 95,000 users over time and especially our thousands of regular users. It was a good time, but not good enough to make a business from in the current world. Please try http://www.lala.com or http://www.mp3tunes.com They are both good companies and have a lot of users"
Isn't mp3tunes an Michael Robertson company? it seems that Michael's ajax13.com or syncwizard.com has died. I don't know how a person surfing the Internet (including via Sideload) shouldn't presume good title on songs being distributed--until shown otherwise. I have only fledgling experience with the U.C.C., but this presumption is one of the basic principles. If a site out there is offering an MP3 for free, "customers" have a right to presume good title (that is, that the site is authorized to distribute said MP3) until such time as they are notified otherwise. Let suppose your car was stolen and the police found someone riding around in it and they said "I bought this from Michael Robertson, I didn't know it was stolen." Would you be happy if the police let him keep YOUR car just because he innocently bought it? I'm sure you would want your car back, and you'd get it back. The police would recover your stolen property and the buyer who was swindled out of his money to buy it would be out of luck. Buyers have a responsibility to make reasonably sure what they are buying is legally obtained OR run the risk of the consequences when taking stolen property. I'll throw in my comments having run across Kevin's blog. Some comments over time about Kevin being a disgruntled employee. I worked at Linspire about nine months and Kevin fired me. I am not a disgruntled employee, he fired me because I didn't fit the company and gave me a very fair severance and no hard feelings. I mention this because I think it adds to the credibility of my comments, tho I am posting anonymously for the obvious reason that it can't help my career to acknowledge being fired. I had plenty of opportunity to observe how Michael Robertson does things and have no difficulty believing all of Kevin's observations, they are consistent with mine. He was a petty, emotionally uncontrolled person, who engaged in tirades against employees over matters innocent or even when the employee was correct. A fair characterization would be "abusive" -- I only got that treatment once, but I saw it happen to others. He would get an idea unrelated to Linspire and divert company resources to it, and they were invariably either bad ideas or at the least so badly executed as to be a waste of the resources involved. He did not recognize the normal and appropriate boundaries between Linspire & his other businesses. I'm glad I had no options to exercise, I expected Linspire to be a roaring success and I can't pin all the blame on Michael but I'm sure glad I have no financial stake. Interesting to read tho...karma is real.